If you’re like most people that are getting ready to pop the question, you are probably a little curious about how much you want to spend on a diamond engagement ring. While some people are set on buying a brand new ring, others opt for antique & vintage engagement rings. Regardless of where you fall in that spectrum, budget is usually a top priority. As such, most searches usually start with looking for affordable engagement rings in your area. When shopping for affordable engagement rings, the most important thing to remember is you don’t skimp on quality. Whether your budget allows for a $350 ring or a $35,000 engagement ring, you’ll want to get your money’s worth. Another thing to remember is dealing with a reputable engagement ring store. One that has a history of treating their customers with respect and ensuring they’re happy long after their purchase. 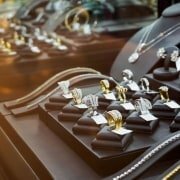 Let’s explore some important factors to shopping for affordable engagement rings in Orange County. Together we’ll look at why Watch & Wares has been the best place to buy affordable engagement rings for over 35 years. Now that you have a budget in mind, let’s talk about what makes an engagement ring affordable. Affordable engagement rings doesn’t necessarily mean the ring you choose has to be cheap. For instance, some engagement ring stores in Orange County and surrounding areas will allow you to make payments. Furthermore, other jewelry stores will let you put a diamond engagement ring on layaway. This method is great, because you’re dodging those pesky finance charges. Today, things have changed. With so many options when it comes to affordable engagement rings, you shouldn’t limit your thinking in terms of salary. Pick a budget for your diamond ring and stick with it. Do some online research and find the best place to find affordable engagement rings in your area. Once you’ve got a handful of places to check out, visit the stores and see how they stack up against one another. Watch & Wares has sold more affordable engagement rings than anyone in Orange County for the last 35 years. With a stellar selection of affordable diamond rings and jewelry, we’ve been a part of more SoCal weddings than any other jewelry store in OC. Just remember, affordable engagement rings will vary from person to person. What might be a fortune to spend for one buyer, may be just right for another. Weigh your options, find the engagement ring store with the best terms and merchandise and choose with confidence. The right engagement ring store will make your purchase stress-free, letting you know you’ve made the right choice. Watch & Wares has 3 brick & mortar stores and has been selling online since the 1990’s. On eBay, our feedback is 100% and we’re a jewelry lover’s favorite on Etsy, where our customers rave about our affordable collections. Our flagship engagement ring store in the Orange Circle has a 5-star rating on Yelp. Customers love our attention to detail, mom & pop’s service and discreet/safe purchase process. When you’ve been collecting as long as we have, you tend to have an enormous selection of affordable engagement rings. Multi-colored gemstones, colored diamonds, to platinum, white gold and antique settings — we’ve got it all! 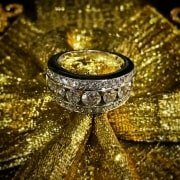 If you’re looking for an affordable diamond ring to present to the love of your life, call us first! Watch & Wares also has an In-House Jeweler, known for his expert jewelry repair & custom engagement rings. We can create a ring for you from scratch or recreate a cherished heirloom from a photograph. When it comes to vintage and antique engagement rings, we’re the experts. We’re the engagement ring store other Orange County jewelers bring their customers’ diamond rings to, to have them fixed or set properly! Want to space your payments out over 12 months? No problem! Watch & Wares offers layaway on all our affordable engagement rings, with 0% interest. Simply leave a 20% deposit, then make monthly payments. Pick up your diamond engagement ring once it’s paid off, with no fees or interest! Call Watch & Wares & Let Us Help You Find an Affordable Engagement Ring She’ll Love! Our Owner and Engagement Ring Experts are here Tues-Sat from 10am to 5pm. Walk-ins are always welcome, or you can give us a call at 714-633-2030 to set a one-on-one engagement ring consultation! If you’re in the market for affordable engagement rings and live close to Orange County, we’d love to serve you! 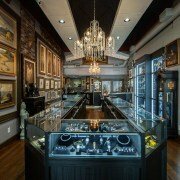 Our reputation speaks for itself and we’re eager to prove why we’re the best place to buy affordable engagement rings in Southern California. If you have any questions or concerns, you can also send us message using the handy contact form on this page! We look forward to serving you and helping you find the engagement ring of your dreams soon!